Sometimes, we get inspired by something we read online and want to capture it and comment on it. Other times, we come up with an idea out of nowhere and want to jot it down, or say it out loud into our phones before we forget it. Writing and collecting ideas and thoughts nowadays is easily done with the right app on your smartphone. In order to make your search easier, we looked and discovered one great organizer app for all your ideas and thoughts. Let’s see what the app offer you. 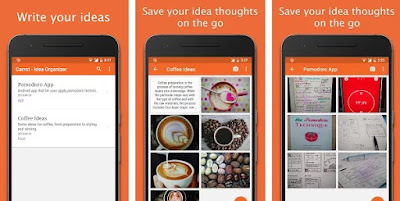 This organizer app is developed on android platform as one simple, easy to use and highly practical app that allows its users to save their thoughts, create ideas, organize and manage all their ideas in one place, saving their thoughts on the go. With the help of the app, users have the chance to write and thoughts, forging a good idea and even grow that idea by brainstorming it with questions. Users will easily collect their ideas and thoughts, manage them as they want and growing them bigger. Carrot Idea Organizer is offering its users very helpful and efficient features that allow them to collect and save their thoughts and ideas on the go. With the help of this app, users can easily create ideas writing them and saving them whenever they think of something they like to remember. Users on the app are offered to write notes to their ideas and create todos lists to their ideas if they want to. Also, the app allows users to even take pictures to their ideas. For all users that like to brainstorm their idea to make it bigger, they can use the app to question their idea with prepared questions so they can grow it or users can create fast new ideas with a widget as well. The app offers all the users need in one place to collect and create ideas while brainstorming them to make them bigger, organizing all their thoughts in one place, managing them by preferences whenever they want to. Download this app for free now on Google Play to write and organize your ideas and thoughts!